BeeWi, the wireless accessory manufacturer, have today announced the Scara Bee. 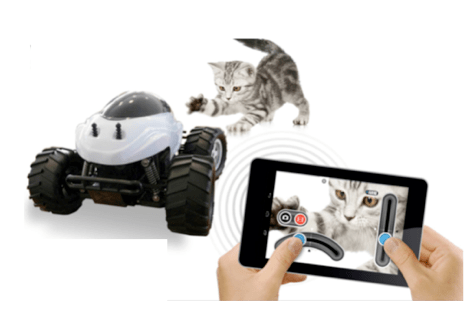 It acts as the latest product in a range of app operated toys from the company, and is an all terrain buggy with a built in VGA camera. It relays live footage back to the smart device controlling it, and it can also take still images or short videos. It retails at £89.99, and can be bought from Maplins. The app comes for both Android and Apple devices. The buggy itself is based on the Mars Rover, and it also acts as an ADHOC WiFi peripheral in order to connect to your choice of device. The app allows the user to twist and turn around obstacles with the flick of a finger or a tilt of the wrist. Powered by a Lithium battery and compact in design, the Scara Bee measures at 23x20cm to ensure that the buggy can discreetly use its inbuilt camera to capture whatever it encounters on its travels! For more information on all BeeWi products, please visit www.bee-wi.com.